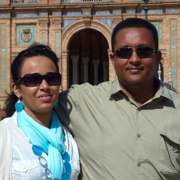 When my mother’s maternal grandfather moved to Mogadishu, he stayed at his daughter’s house. All his life he was a pastoralist but as he became old and feeble, he decided to settle down. City life was new to him and he had to learn a few things the hard way. One of the problems he faced usually happened during his midday meal. My grandmother would place his plate on a mat set on the porch. Being a man of the outdoors, it was his favourite spot. It was also a spot that the family cat liked to frequent. He had never seen a cat before in his life and he delayed making up his mind about it. Unknown to my grandmother, the cat was sharing the midday meal with her father. After a week of this, he chose a quiet moment to broach the subject with his daughter. He said gently, “Maandheey, bahalka aad cunnada na-wadaajisay, hilibka uun buu cunaa.” Dear daughter, that thing that you made me share the food with, eats only the meat. My mother used to tell us this story, but she later informed us that it wasn’t a true story and that it is used to make fun of nomads who move to the city. 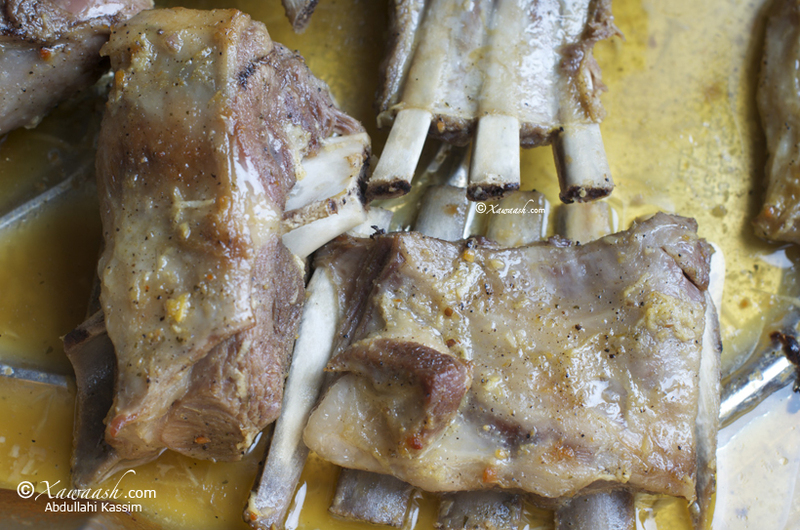 We decided to make this recipe after we started receiving a lot of inquiries via email when we posted the recipe for “Milk-fed Goat.” The inquiries were about where to buy baby goat, and most were having a hard time finding it. This recipe was made from lamb that weighs 45 lb. 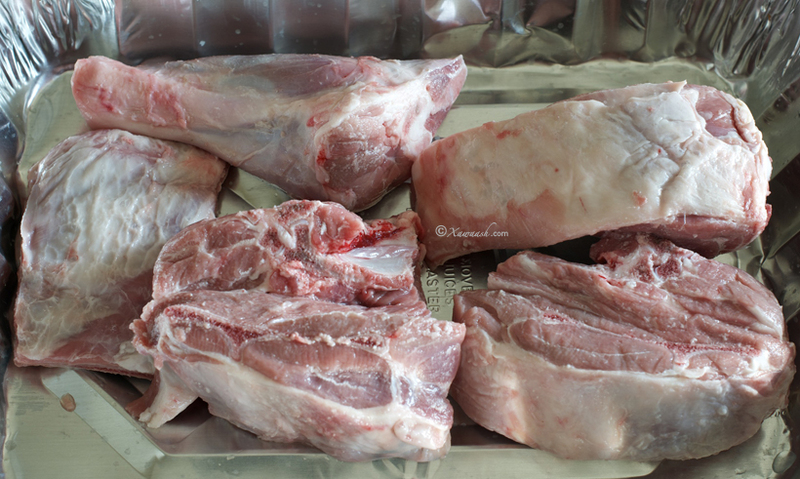 If you prefer meat that has less fat, we recommend buying goat meat. Use fresh lamb or goat for this recipe. 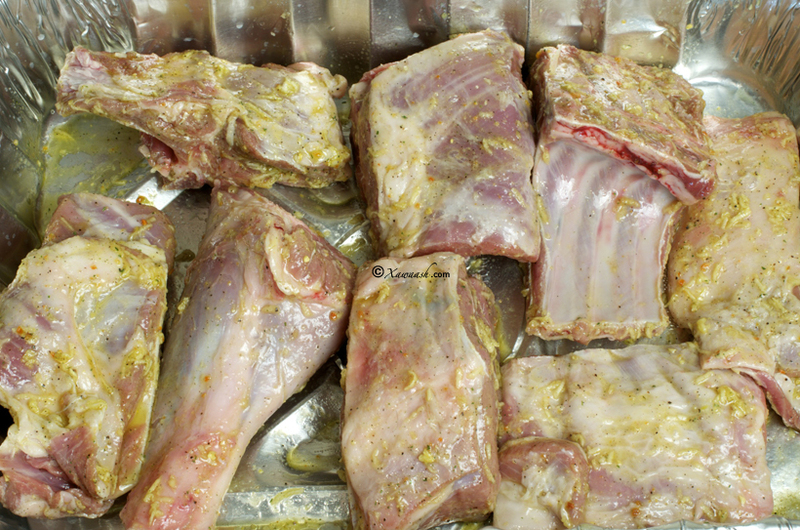 Frozen and lean goat meat will require adding water and cooking time to make the meat fork tender. Quand le grand-père maternel de ma mère est venu vivre à Mogadishu, il s’est installé chez sa fille. Toute sa vie il avait été un pasteur (berger) mais lorsqu’il devint trop vieux et faible, il décida de se poser. La vie citadine était nouvelle pour lui et il eut à apprendre certaines choses sur le tas. Un des problèmes qu’il rencontrait régulièrement se présentait lors du déjeuner. Ma grand-mère lui posait son assiette sur un tapis sous le porche. Il était un homme des grands espaces, c’était son endroit préféré. C’était aussi la place où s’installait le chat de la maison. Il n’avait jamais vu un chat de sa vie et il ne savait pas quoi en penser. la situation avec sa fille. Il dit doucement, “Maandheey, bahalka aad cunnada na-wadaajisay, hilibka uun buu cunaa.” Ma fille chérie, cette chose avec qui tu me fais partager la nourriture, ne mange que la viande. Ma mère nous racontait souvent cette anecdote, mais elle nous avoua plus tard qu’elle n’était pas authentique et qu’elle était en fait racontée comme une plaisanterie sur les nomades qui venaient vivre en ville. Nous avons décidé de faire cette recette après avoir reçu beaucoup de demandes par mail après la publication de la recette du “chevreau de lait”. Les gens souhaitaient savoir où se procurer du chevreau, et beaucoup avaient des difficultés à en trouver. Cette recette a été réalisée avec un agneau de 45 livres. Si vous préférez une viande moins grasse, nous vous recommandons la viande de chèvre. Utiliser de la viande fraîche d’agneau ou de chevreau. Si vous utilisez de la viande de chèvre surgelée et préparée, elle nécessitera d’ajouter de l’eau et plus de cuisson pour qu’elle se détache à la fourchette. In an aluminum pan, mince the garlic (we use a grater) then add the vegetable seasoning, vinegar, olive oil, and black pepper. Mix well then coat the lamb pieces with the marinade. You won’t be able to pick up all the marinade from the pan. Don’t worry, you need the leftover marinade there. 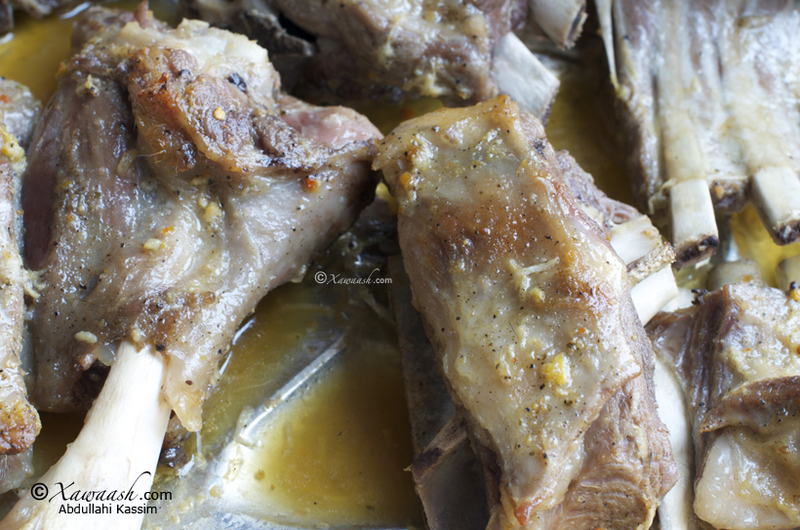 It will mingle with the juices released by the lamb and together they will make a delicious sauce. Cover the pan with aluminum foil, making sure that the steam that will form will not escape. Place the covered pan in the oven and bake for 2 hours. Wearing oven mitts, remove the cover from the pan. Beware of the steam as it can burn you. The meat will be fork tender and can be served at this stage. However, we prefer to brown the meat and melt some of the fat. Broil the meat, uncovered, at 500°F for 5 minutes. Préchauffer le four à 500°F/260°C. Dans un plat en aluminium, mettre l’ail haché (nous avons utilisé une râpe) puis ajouter l’assaisonnement, le vinaigre, l’huile d’olive, et le poivre noir. Bien mélanger puis masser les morceaux d’agneau avec la marinade. Vous ne pourrez pas récupérer toute la marinade du fond du plat. Ne vous inquiétez pas, il faut laisser le reste de marinade au fond du plat. Il se mélangera au jus de viande exprimé par l’agneau et ils formeront une sauce délicieuse. Couvrir le plat avec du papier aluminium, en s’assurant que la vapeur de cuisson ne s’échappera pas. Mettre le plat couvert au four et cuire pendant 2 heures. Avec des maniques, retirer le papier recouvrant le plat. Attention à la vapeur, elle peut causer des brûlures. La viande sera très tendre et peut être servie tout de suite. Toutefois, nous préférons laisser colorer la viande et faire fondre son gras. Passer au grill, sans couverture, à 260°C/500°F pendant 5 minutes. 1. Écraser l’ail (nous avons utilisé une râpe). 2. Ajouter l’assaisonnement légumes. 3. Ajouter le vinaigre. 4. Ajouter l’huile d’olive. 5. Ajouter le poivre noir. 6. Recouvrir les morceaux d’agneau de marinade puis couvrir la plat avec du papier aluminium et cuire à 500°F/260°C pendant 2 heures. asc …looking really good and tasty thankz again for ur sharing with us waxan idiin rajeynaya qeyr insha allah. You are most welcome. The recipe does not work for frozen meat. As we mentioned in the introduction, if you decide to use frozen meat, you will need to add water and you will also need to increase the cooking time to make the meat fork tender. ASC, AAD AYAA U MADSANTIHIIN SIDA AAD NALA SHARE GREYSEEN AQOONTIINA. KHEYR AYAAN IDIIN RAJEEYNYAA, MACSALAAMA. Adigaa mahadda mudan. Hadduu Ilaahey yiraahdo waan soo gelin doonnaa. Mahadsanid. Waa ku-mahadsan tahay faalladaada. Hadduu Ilaahey yiraahdo waan soo gelin doonnaa bariis noocyo kale. Mahadsanid. Assalaamu caleykum. walaalayaal waan idin salaamay labadiina iyo reerkiina dhan. aad ayaan bloga ula socdaa cunooyin badan aan halkan ka bartay oo aan sameeyayna way jiran lakinse wali wax qoral ah aan idin qoray ma jiran. aad ayaan idinkugu mahad celinayaa faa’iidada aad inoo faa’iideyseen Illahay ajar iyo xasanaad fara badan ha idinka siiyo aamiin..
Waa ku-mahadsan tahay salaanta wacan. Aad iyo aad ayaan ugu faraxnay qoraalkaada, waanna jecelnahay inaad nala xiriirtaan oo aad noo sheegtaan waxaad jeceshihiin inaan soo gelinno. Waxaan rajaynaynaa inaad wada jeclaateen hilibka. Mahadsanid. Waa ku-mahadsan tahay faallada iyo ducada. Ilaahey qayr ha ku-siiyo. asc wr wb walaal yaal illaahay waxan idin kaga bariyey in u idin xafido gacantiina idin barakeeyo hadan nahay bahda somalida qurba joogta ah webkaan ad ayaan ooga faaideystay illahay ha idin barakeeyo intaan iyo in ka badan wan idin ka sugeyna wbl tfq. Hadduu Ilaahay yiraahdo waan soo dadaalaynaa. Waa ku-mahadsan tahay faallada. Qayr ayaan kuu rajaynaynaa. i have been making a number of the recipes you have, and i have to say you are turning me into a full-time cook in the house! I am really so happy to have found you blog. One question though: I tried to make the roasted lamn tonight, but things didn’t turn out all too well. The meat got really burned after baking it for 2 hours at 500 degrees. Is the 2-hours time correct? Thank you vey much for your nice comment. Did you cover with aluminum foil? It is very important you wrap it tightly with aluminum foil so the steam won’t escape. Also did you use fresh lamb? Frozen goat has to be cooked first then roasted. I actually did both of those things, but somehow the meat got burned. I will try it again sometime. Thank you for all the great help. Your blog makes us all very proud!! 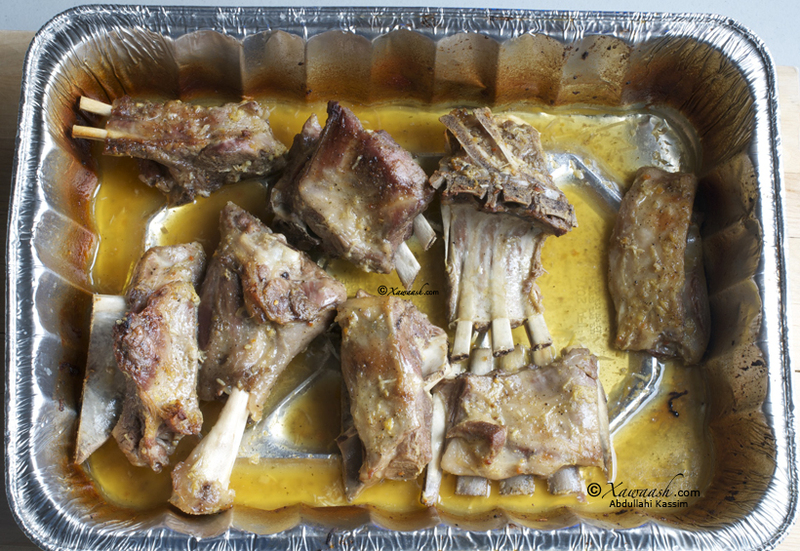 ramadaan kariim, masha allah for your recipe roasted lamb,jazaakallahu qeyran. I love recipe for roasted lamb but the thing is I don’t know how to make vegeta seasoning could you please help me with it.